It's been snowing and blowing for weeks here in western Pennsylvania, with temperatures below zero some nights and highs in the teens. 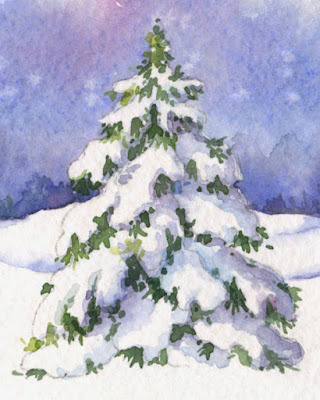 What better time, then, to paint snow-covered evergreens? 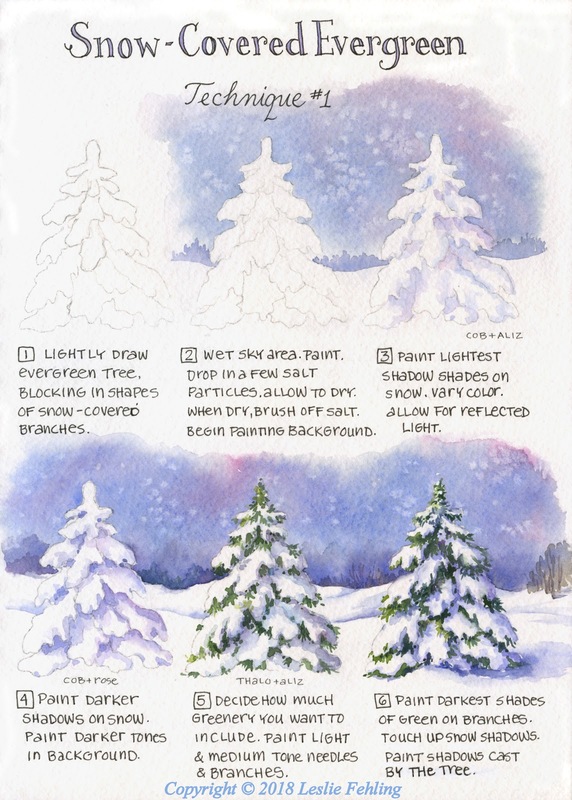 Before we get into painting the tree, let's talk about some color-mixing options for those cool blue shadows that we see on snow. When painting a snow scene, you'll have a range of shadow values. 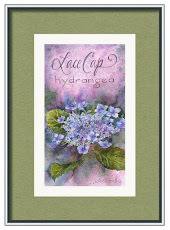 The deep blue-gray and purple shadow colors I mixed above would be diluted to make more subtle shadows that are lighter in value. 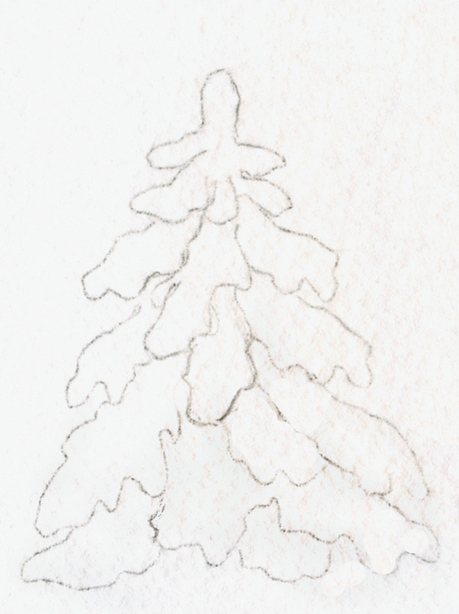 1 - Lightly draw the evergreen tree with a pencil, blocking in shapes that represent individual branches covered with snow. There's no need to separate the snow layer from the green branches at this point. 2 - Wet the sky with clean water. Mix up a generous puddle of paint for the sky. 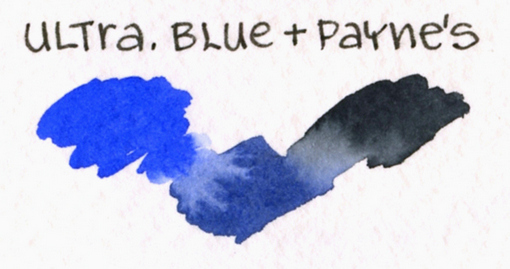 Color choices are up to you - it could be a sunny Cerulean Blue sky or a stormy blue-gray with touches of purple in it. Brush paint onto the sky area, making a graded wash that is darker at the top and gradually gets lighter toward the horizon. If you'd like to suggest snowflakes in the sky, drop a few crystals of kosher salt into the sky wash while it's still wet. (Kosher salt is easier to handle than table salt, because of its larger crystals.) Let the sky dry thoroughly, then brush off the salt. Paint distant trees in the background. If you paint them while the sky is still wet, the trees will have soft edges and look out-of-focus. If the trees are painted on dry paper, the top edge of the treeline will be more defined. In any case, keep detail to a minimum - our focus is on the evergreen in the foreground. 3 - Begin painting shadows on the clumps of snow that cover the branches. 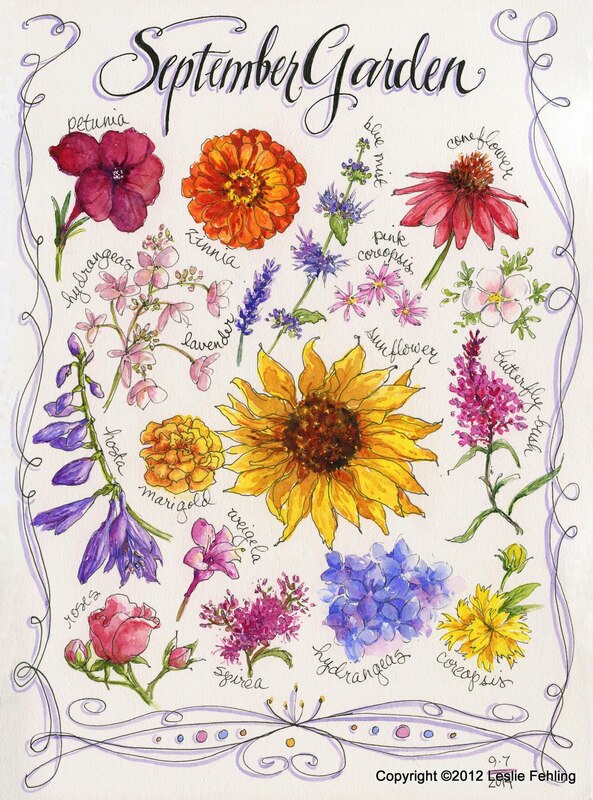 Use light to medium values, and vary the colors, if you like, incorporating pink, blue and lavender tones. 4 - Paint darker shadows in the deepest recesses of the tree branches and cast shadows where an upper branch shades a lower one. Our tree now appears to be completely covered with rounded clumps of snow. In my example, I painted rolling, hilly terrain in the background behind the trees. To do this, lay down a stroke of paint on dry paper, indicating the top of a hill, then immediately rinse your brush and blot excess water from it. (The brush should be very damp, wet but not drippy.) Drag the damp brush along the upper edge of the brush stroke to soften the edge and feather out the paint. Repeat the rinsing, blotting, and dragging until you've diluted the edge of the paint so much that there's nothing there but clear water. This will give you a soft-edged shadow, as shown on the hills below. 5 - Now it's time to add some greenery to our tree. If the snow is heavy and thick, there will be very little green showing. If it's a light coating, you'll see more of the branches. 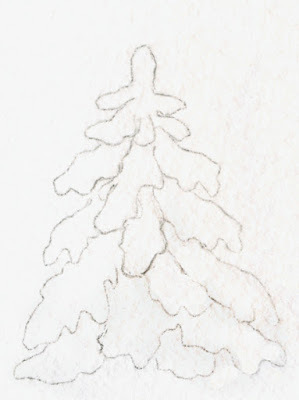 In my sketch, the branches are heavily laden with snow with just a small amount of greenery peeking out. 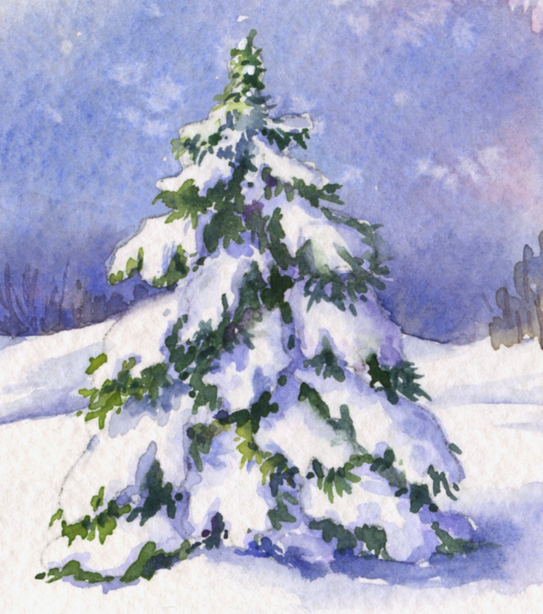 I used a size 4 round brush loaded with light and medium values of green to paint the pine needles on this 3" tall tree. 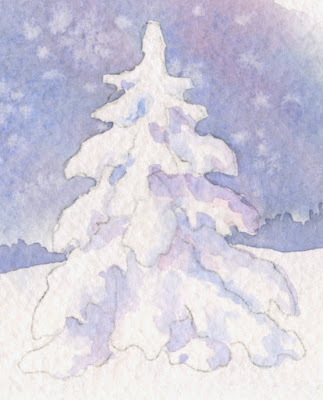 (I'll cover how to mix evergreen colors in tomorrow's post, "How to Paint a Snow-Covered Evergreen Tree - Technique #2".) The greens on the sunny side of the tree have more yellow in them, and the ones on the shady side are bluer. Paint the needles as irregular linear masses at the bottom edge of each clump of snow, extending down onto the snow-covered branch below. Vary the size of the needle sections - some branches will have more green peeking out from under the snow, others less. Be sure the direction of your brushstrokes makes sense and follows the way the tree grows. 6 - It's finally time for the finishing touches. Evaluate the tree - is there enough value contrast? It's important to have bright highlights and deep, dark shaded areas. That's what makes a scene appear sunlit. 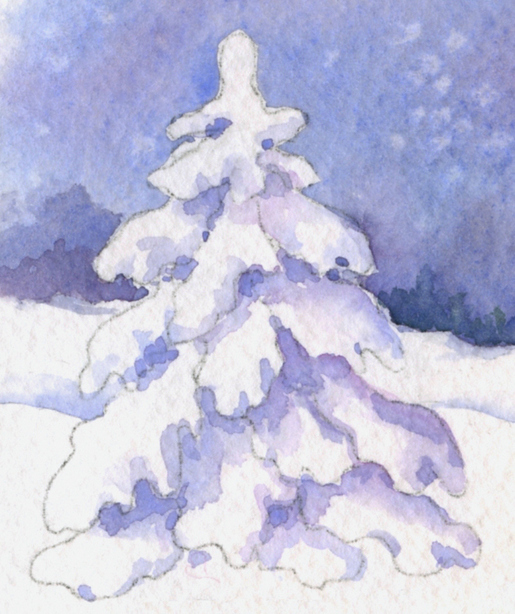 In my example, I added touches of very dark green foliage and some deeper shadows on the snow-covered branches. I also painted the shadow cast by the tree on the snowy ground. Note: When I wrote this lesson for a watercolor class a few years ago, I drew and painted six separate trees on one page, so I could show my students the details of each step in the painting process. 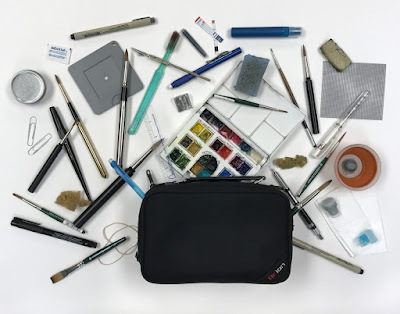 If you compare them, you'll see that they vary slightly from each other - don't let that confuse you if you want to try painting along with this tutorial. 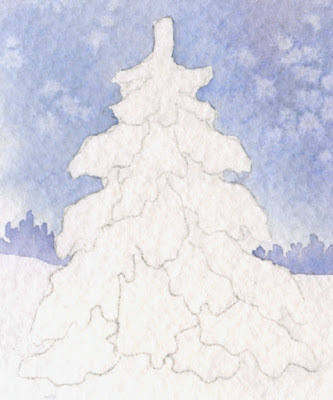 Tomorrow I'll show you another technique for painting snow-covered evergreens. Try them both, and see which one you prefer! 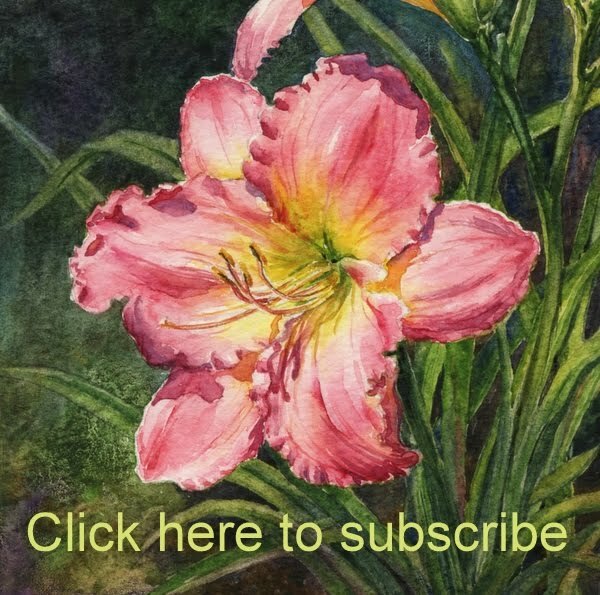 Find more step-by-step watercolor tutorials on the "Tutorials" page of the Everyday Artist blog. What fun! Thank you for this tutorial! Our snow left us over the weekend. We, too, have been experiencing sub-zero temperatures, but the last couple days have been in the 50s. It smells and feels like spring, but I know it's a false hope. We have a lot of winter to go yet here in Ohio. I just flew down to Florida yesterday to teach two workshops, and the warm sunny weather feels so good! I love seeing green grass and flowers blooming. 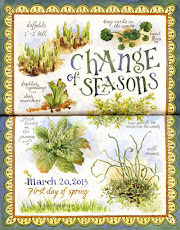 This should help me get through the rest of this winter - spring will be here before we know it. And what a beautiful spring it will be! I think it might be my favorite time of year. Thanks, Annie! Guess we were both writing about painting snow this past week. I enjoyed your wintery tutorial, too. How interesting! This was a well explained tutorial. I will definitely be trying this out around Christmas time!